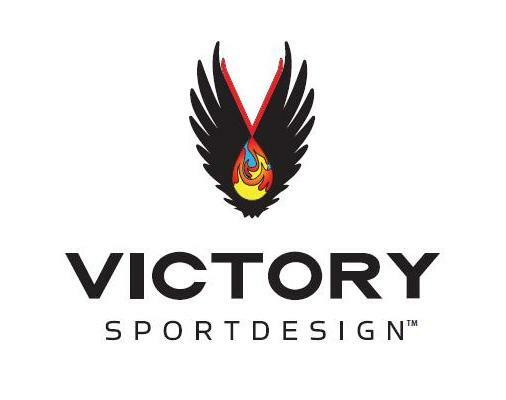 “It was important to score points today and I went for them with my guts.” -Richard Virenque, retired French pro cyclist, known for his long, lone attacks in stage races like Le Tour de France, held annually in July. While on vacation in Tahoe at the end of June, I got the itch to race something short and fast with nothing to do but go hard from start to finish. 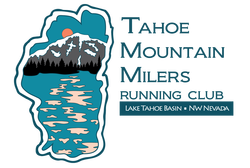 I signed up for Tahoe Rim Trail 55k, to be held on July 21st. 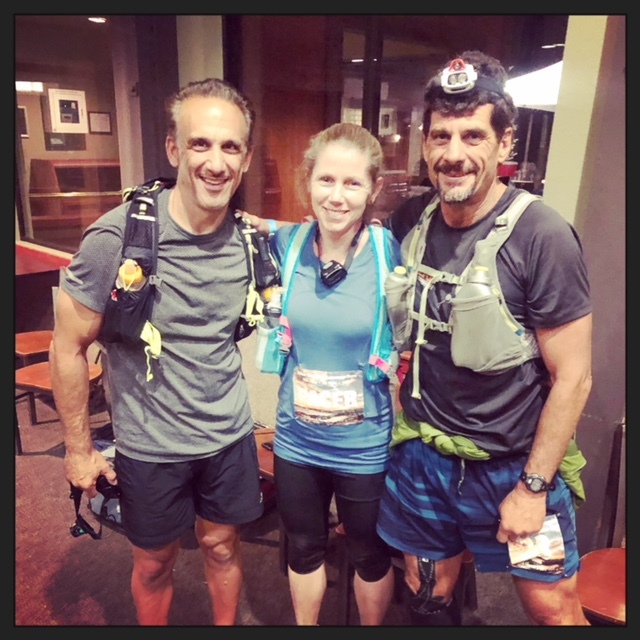 Of their three events—the 100mi, 50mi, and 55km—I’d never done the 55k before and thought that doing something even shorter beforehand would serve as a nice tune-up. 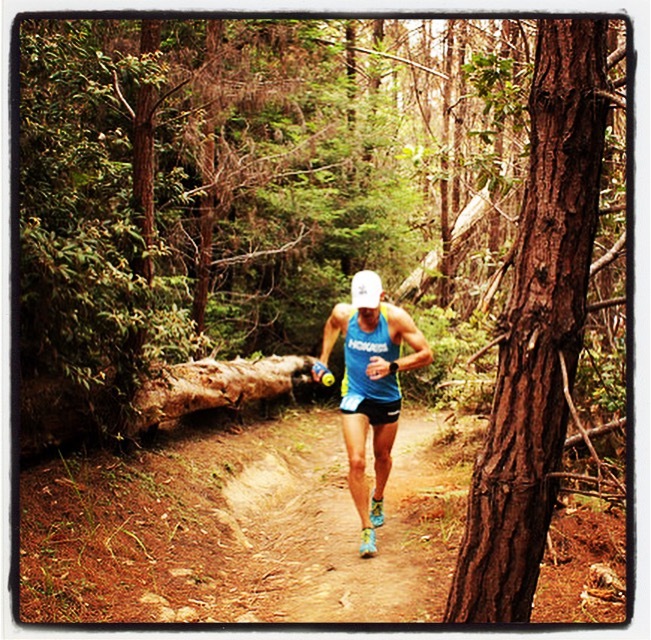 I searched for a race two weeks out from TRT 55k and found one from Coastal Trail Runs. Perfect! July 7th. Golden Gate 30k. I’d basically been doing nothing but working on my tan and drinking beer since walking in the final 20 miles of Western States 100 on June 23rd. So when I was doing my warm-up the morning of Golden Gate, it was obvious—my legs were crazy fresh and I was ready to rock. It felt amazing to just tear off this sea-level start line and just sit on what I perceived to be my sustainable 30k intensity. I’d just gotten the new Suunto 9 a couple days before and this was the first race in quite while for which I’d worn a watch. 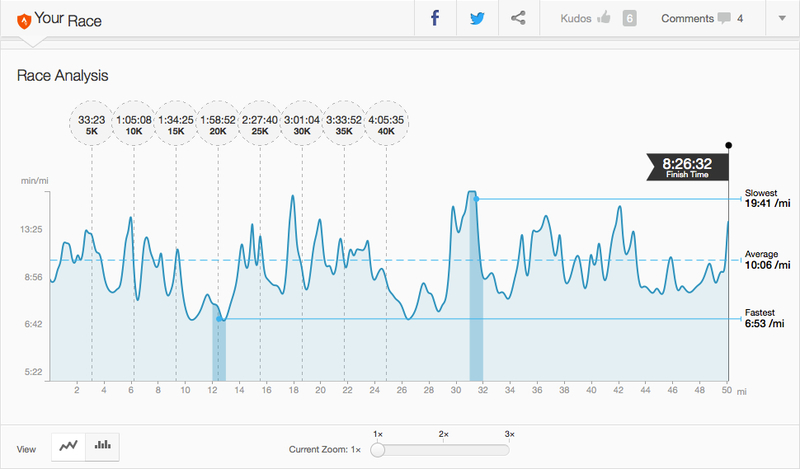 To add to the fun, I knew the CR pace was about 7:40/mi so I’d check in with that a little later in the going. Uphill start from Rodeo Valley. Felt good to red-line it. Two young guys went with me and we’d dice it up for a quite while before I’d work to pull away in the final miles of the race. It was a super fun event and exactly what I needed to clear my head after Western States. Cruising on the road into the finish line, I end up snagging the win and lowered the 2012 course-record by four minutes (7:28/mi pace!). 2nd place, Terence Hurley (31), also went under the old CR, now on a slightly harder, longer course. And 3rd place, David Elk (22), missed the CR by only a couple seconds. This is the power of competition. We pushed each other so hard out there and because of it we all ran at—or damn close to—our full potential that day. So fun. 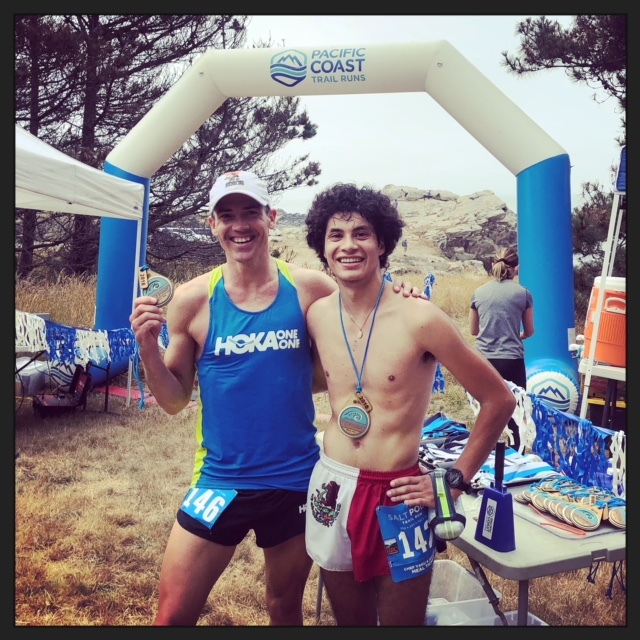 I’d traveled down to Golden Gate with a buddy and athlete I coach, Andy Manaster, and it was cool to hang out, cheer on folks, and wait for him to finish the 50k, where he snagged the age-group win and 5th overall in a competitive field. Just a great day. I was flying high! July 14th. Salt Point 26k. After Golden Gate, as stated, I wasn’t planning on racing again until Tahoe Rim Trail 55k on the 21st, but new Pacific Coast Trail Runs RD, Greg Lanctot reached out to me early in the week and invited me to come out to Salt Point State Park on the coast, and experience the new, improved PCTR. I told him I couldn’t do the 50k ’cause I had TRT 55k the next weekend but, after some thought, said what the hell and told him I’d come run the 26k. 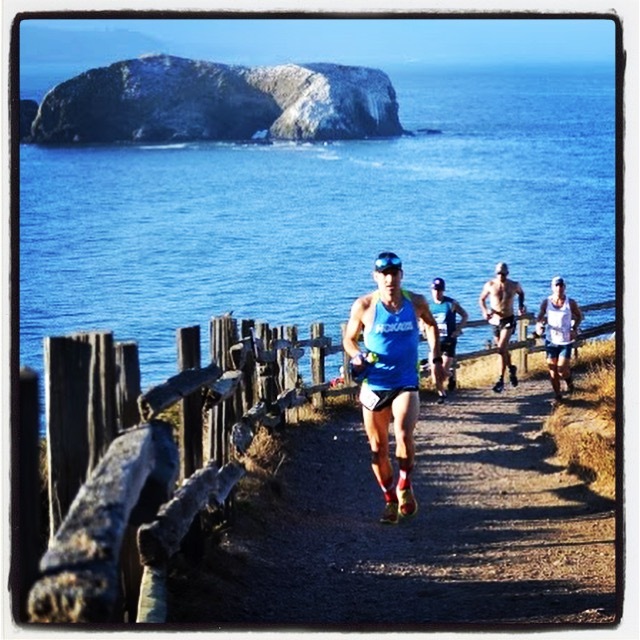 I hadn’t raced out at Salt Point since 2011, when Leigh Schmitt left me for dead in the 50k there. I’d been trying to have my cake and eat it too with regards to straddling two sports, ineffectively I might add—long-course triathlon and ultrarunning. I was just coming off Full Vineman, looking ahead to Ironman Hawaii in October, and thought I had this 50k in the bag until I met Leigh out on the trail, for the first time that day, and discovered he was the real deal. We’d end up training together for a while before he’d pack up the family and move to the Bahamas, of all places!, where he still teaches with his wife there, at The Island School. Hard to believe it’s been seven years since we’d raced each other out there. Time goes by like course ribbons in a 26k! Salt Point 26k finish line with Luis Quezadas. Healdsburg Running Company’s, Luis Quezadas, 19, would be my primary competition and he led us out. I bashed my head into a downed tree trunk, saw a few sparks in my field of vision and kept cranking. Gawd. I’d decided to wear the 7oz HOKA ONE ONE, EVO Jaws for this race, and even did a fun, 4:40 downhill mile the evening before to really prime my legs for some aggressive downhill running out at Salt Point the next morning. As was the case back in 2011, experience paid off, and the veteran moved in to 1st on the early climb up the ridge. 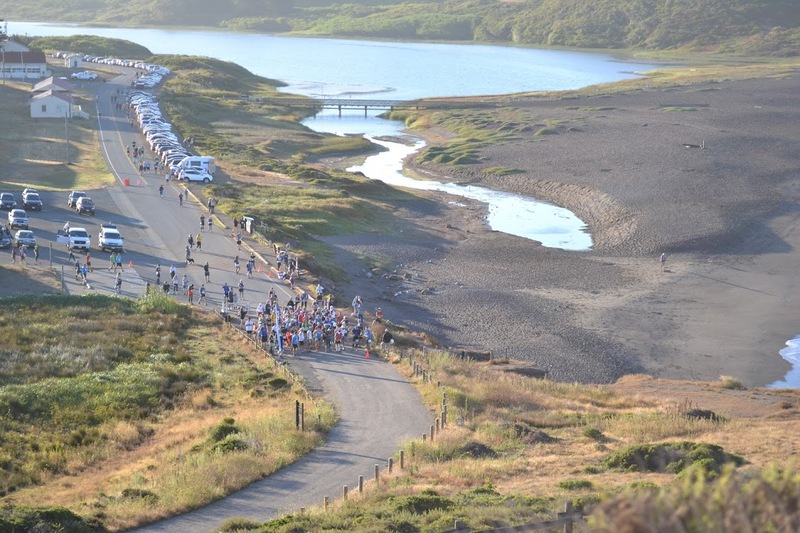 I kept my foot on the gas around the first loop, across Route 1, onto the bluffs overlooking the Pacific Ocean, then back out to crank out the second, shorter loop of the 26k, back across Route 1, onto the bluffs, to the finish. Stunning views! Because PCTR was under new ownership, I hadn’t thought to look at the existing CR for this course. I just kept cranking away in the race. 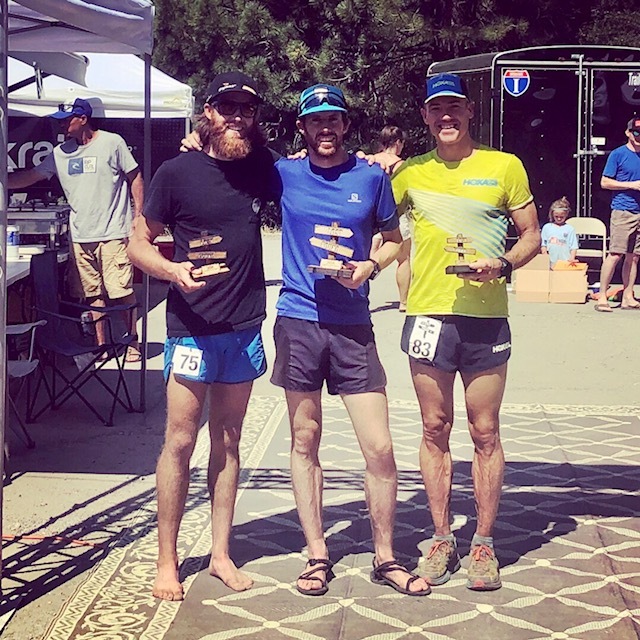 Toward the end, I felt like breaking two hours would be possible but I didn’t want to kill myself, since I’d just raced 7 days before and I would be racing the longer 55k at elevation in 7 days, so I put in the effort to win it and came across in exactly 2 hours and change. Nate Seltenrich, 36, crossed the line in 2:06:32, with Luis rounding out the podium, just 20 seconds later. Luis’ time was the 6th fastest time ever run on the 26k course, dating back to at 2004. The next day, I looked to see what the deal was with 26k CR and saw my old nemesis—and good friend!—Gary Gellin, holds the CR from 2008… less than a minute faster than the time I’d just run (of course!). First place in the 50k with a brilliant performance, was Vincent DiMassa, a talented multi-sport athlete, who took about 90 second’s off Leigh Schmitt’s 2011 course-record. We’re not just racing each other out there, we’re often racing ghosts! July 21st. 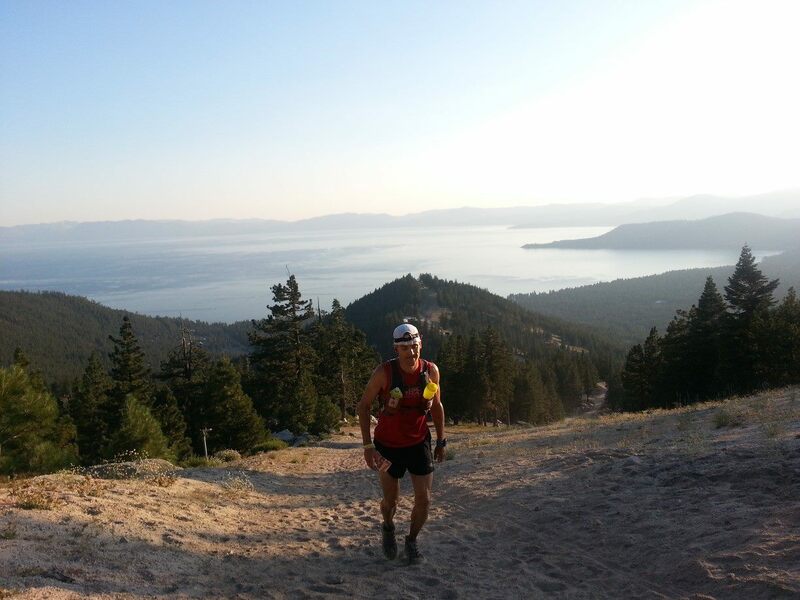 Tahoe Rim Trail 55k. With these two short, fast efforts in my legs it was off to Tahoe. My calves were sore for days after Golden Gate and then less so after Salt Point. 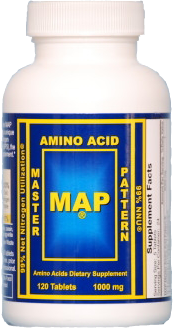 The body was getting into a weekly rhythm of race-recover-prime-race-again. It’s a haul from Sonoma County over to Spooner Lake, on the Nevada side of Lake Tahoe. It took forever to get over there. But I finally arrived around dinner time, got in a quick run, found some friends, ate some food, and went to sleep in my truck. 4:15am wake up call to see the 100-milers start at 5am. So much nostalgia associated with this race, given the fact it’s my 7th time racing here. Motivation for these shorter events never waned and I knew I’d made a good decision to run the 55k today. We were promptly off at 6am. Again, two guys went with me as I launched off the start. Turns out one of them was racing the 50-miler. Having done the 100mi four times and the 50mi twice, it was a unique experience to get back up to the Tunnel Creek aid-station and NOT turn right/north toward Diamond Peak. 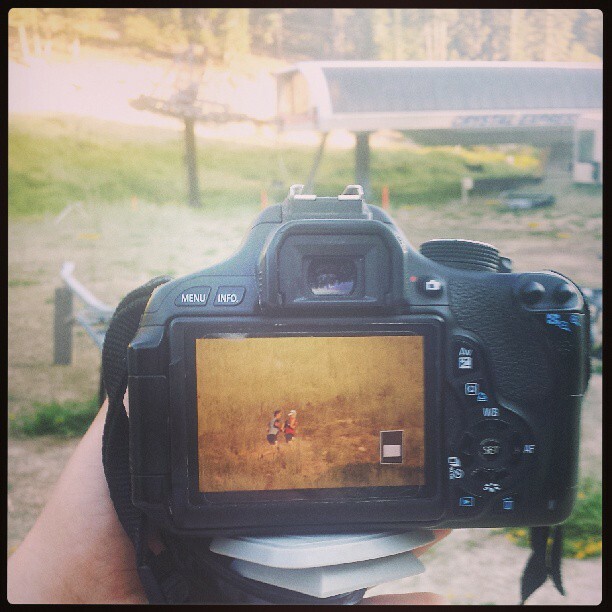 Instead, I got to legally “cut” the course, heading back south toward the finish line at Spooner Summit. Some 50mi runners still coming up thought I was leading the 100 and gave me lots of cheers! Since the EVO Jaws from HOKA had worked out so well at Salt Point and I’d heard that there were folks who’d run up to 50k in them, I’d decided to race in ’em again today for this 34mi event. Light, fast, with good grip on generally soft surface, I’d maintain an average of 92 left-footstrikes-per-minute, according to my Suunto 9, over my approximate 5-hour race-time. I was pleased with how well my feet held up and how fun it was to race in this shoe over shorter distance races! I’ll continue to use it in these type of events. I’d looked back while on top of Snow Valley Peak (9000′) to see if I could see 2nd place anywhere. I’d no idea how much of a lead I had. I was putting out honest effort, though I was thinking about the fact this was race #3 in a row, and I still had a tough 30k to do next Saturday. As I descended the 6mi down to Spooner, I also thought about how Rory Bosio caught me here last year in the 50-miler, with 4mi to go. “Keep pluggin’,” I thought to myself. It wasn’t until the final 100yds of the race it was clear that I’d held on for the win. 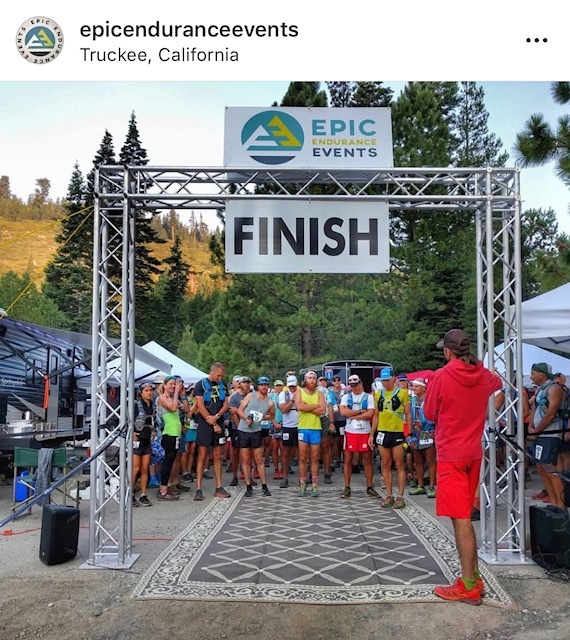 Emily Richards, also of Reno, came across the line a few minutes later, breaking the 55k course-record for the ladies, set all the way back in 2001, the first year the Tahoe Rim Trail Endurance Runs were held. Eight of the top 14 finishers in the 55k were woman. Fierce! Once again, I found myself at another TRT finish line, with friend and TRT RD, George Ruiz. Thumbs way up! With Emily Richards. Tahoe Rim Trail 55k, Spooner Lake, NV. 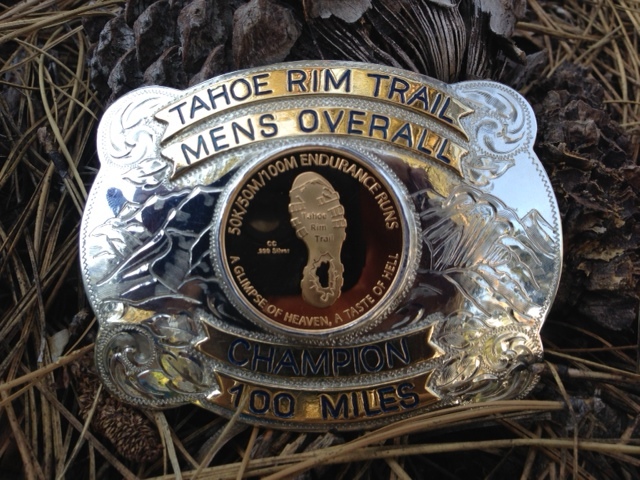 TRT was pretty fun from a coaching perspective too, as I had a guy in the 55k, the 50mi, and two in the 100mi. As more friends started finishing the 55k, it was fun to hang out at the athlete lounge on the lake, eat burritos, and share war stories from the day. Eventually, I transitioned up to the “Stonehenge” aid-station around mid-afternoon. This is the half-way point of the 100-miler. I found more folks to sit with and chat away about stuff. It was fun to see friends in so many roles: racer, pacer, and crew. Ominous clouds threatened thunderstorms but all we got all day was a couple drops of rain. The guys’ race was pretty tight and it was far from clear who was going to win. The ladies’ race was exciting too, with Bree Lambert tearing out of Spooner Summit, in pursuit of leader, Jenny Capel. Diamond Peak aid-station (mile 80). 3:15am. Todd Bertolone (right) with pacers John Tarantino and Carrie Peterson Kirby. 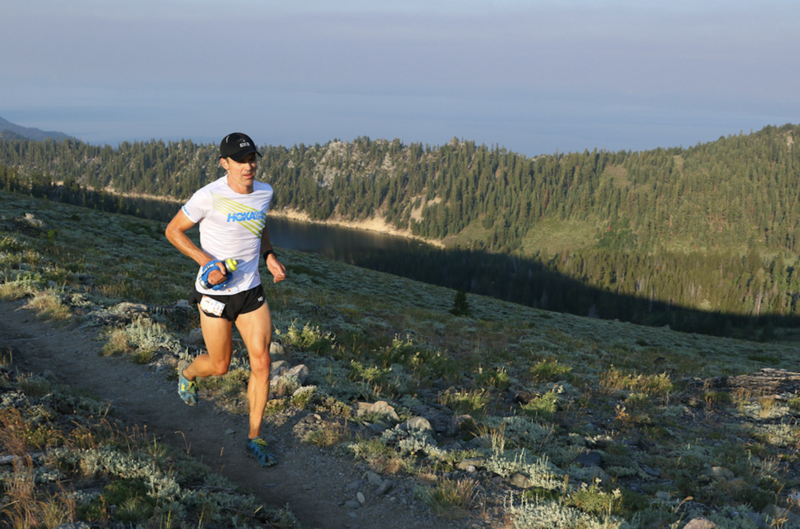 In the late afternoon I headed up to Diamond Peak to hang out and eventually catch the leaders coming through mile 80. 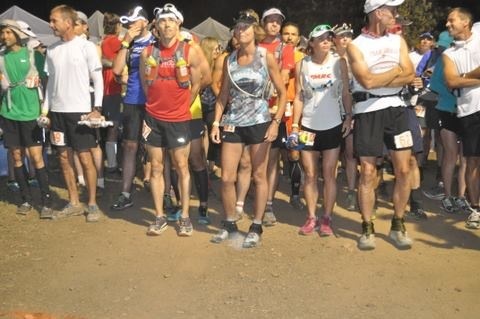 As the evening and night wore on, more and more runners and crew showed up. Words of encouragement were shared. Broth was consumed. Shoes were changed. Pacers were exchanged. And the march up the ski slope began. Once I saw Todd Bertolone come through I eventually headed out of Diamond Peak, got on the road, and started the long trek home. I made it as far as a rest stop outta Truckee before stopping and getting some sleep, ’til the rising temps in my truck woke me up around 8:30am. I made my way to the in-laws in Loomis for a much needed shower. Needless to say, it took me a few days to recover from TRT. Three races down with one to go! On the start-line. Lost & Found 30k, Donner Lake, CA. July 28th. Lost & Found 30k. While we were on vacation in Tahoe, post-Western States, I couldn’t help but look ahead to my next opportunity to run 100 miles—at Run Rabbit Run in mid-September. I’d only raced once leading up to Western States this year, and to some degree, I felt like this hurt me. Knowing that some of my best results have come in years where I’ve raced quite a bit, I decided to put a big race in my build for Run Rabbit Run—Castle Peak 100k, four weeks out from Run Rabbit. I messaged the RD, Peter Fain, stating that I needed to “toughen up,” asking if I could still get in the race. One Ultra Signup invite later and it was a done deal. I’d been encouraged by quite a few folks who’d run Castle Peak to ensure I got up to run on the course to see what it’s all about. 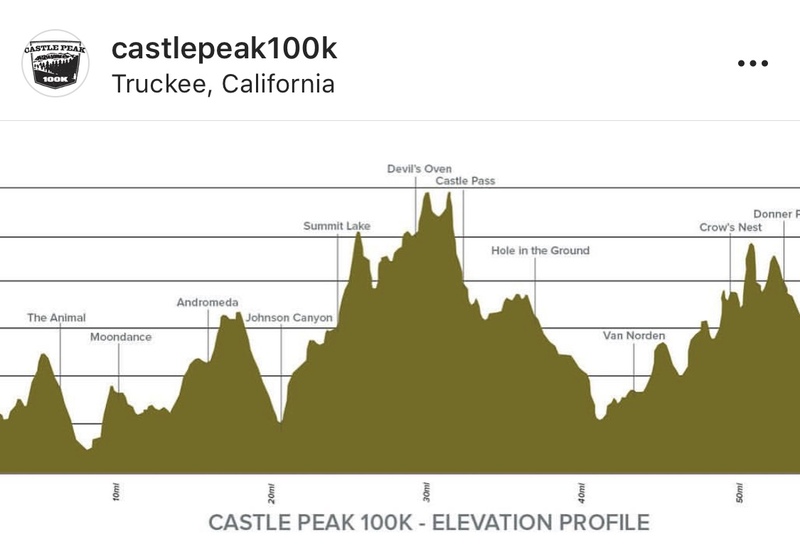 One friend told me, “You don’t want race-day to be the first time you run on the Castle Peak 100k course.” I found out there was a training run but I was already signed up for a race that weekend. If I was gonna make the haul all the way over there, why not race?! And as it so happens, the inaugural Lost & Found 30k was just moved due to permitting issues, from 7/7 to 7/28. I love it when a plan comes together! I reached out to Chaz Sheya at Epic Endurance Events (the same fine folks that put on The Canyons 100k and Overlook 50k) and I was in. 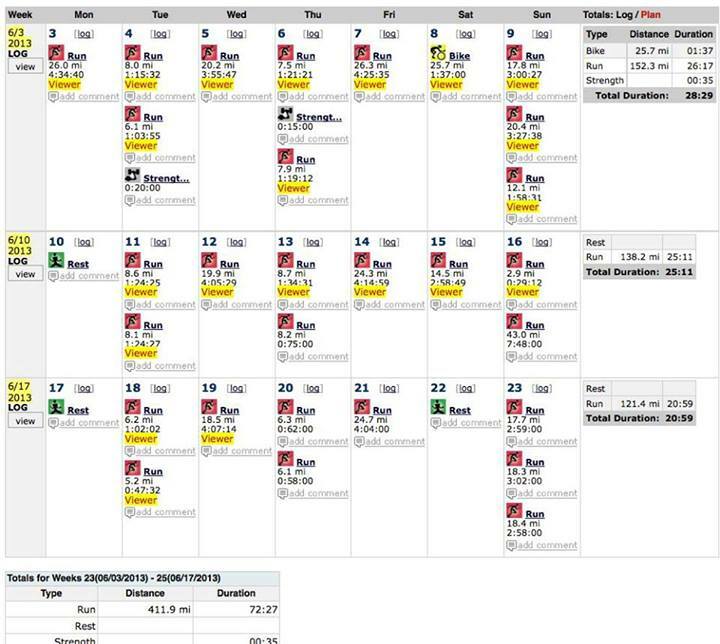 Of my four July events, I knew this one was gonna hurt the most! For the fourth straight Saturday in the row, it was time to step into the arena once again. I’d gotten up to the start/finish venue on Friday evening, even getting a nice little 4-miler in, previewing the last bit of the course, which is just stunning throughout. That evening, we all hung out and shot the breeze. 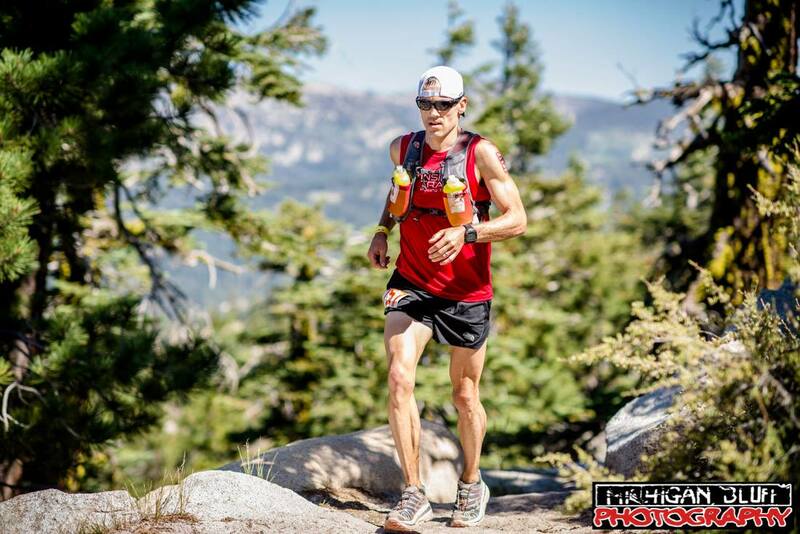 Peter Fain told me this guy, Patrick Parsel, just signed up and that I’d have my hands full with him as well as two-time Castle Peak 100k champ, Erik Schulte. At 44 and a bizzillion races in me I don’t waste any energy getting anxious over my competition. Simply put, they help me get the most outta myself. Just put a runner in front of me on some mountain trails, and I’ll be happy chasing all damn day! No way were the EVO Jaws going to fly on this course, so I ran in a well-worn pair of Speedgoat 2s that probably have over 400 miles in them! They feel amazing, eating up anything a technical course like this throws at ’em. That Vibram sole is the bomb! As I’ve done for three Saturdays in a row, I launch off the start line, fearless, notching right up to my perceived 30k, sustainable red-line. I knew I’d have to show more guts in the early miles of this event since the first half is mostly climb before circling around, with a lot descending late for me to try to catch guys in the second half of the race. Lost & Found definitely does not play to my strengths, as a shorter trail race, starting off with a lot of climb, at elevation. I wasn’t ashamed to have my competitors hear my loud huffin-n-puffin in those early miles. I’m vulnerable. Here’s my belly. It’s a 30k in the mountains and I wanted to limit the amount of time that competitors put into me on the way up so I could catch as many of them as I could on the way down! The views were absolutely incredible. Running along the backbones of these epic mountain ridges was so inspiring. I was grateful to all the volunteers that humped water up to these remote aid-stations. So much work had gone into making this rad little 30k possible. With Erik Schulte in 2nd and Patrick Parsel in 1st (center). 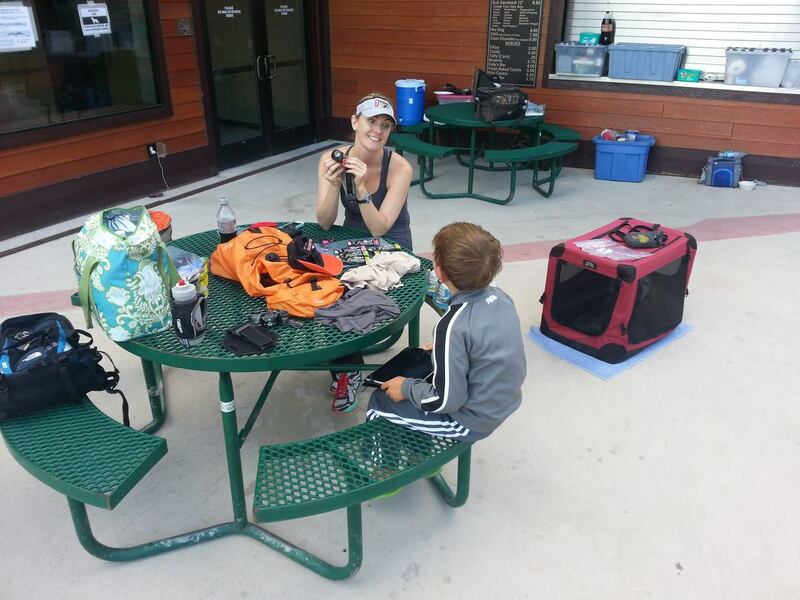 Lost & Found was the last event in a string of Saturday events in July. I wasn’t necessarily feeling TRT 55k and I was pleased to be working hard and running well, totally stoked to be healthy and out here ripping around these awesome trails. The legend, Tim Twietmeyer, iced down a bottle for me around mile 15. I had GU Roctane “Summit Tea” in there and the icy mixture tasted amazing. I threw down a Roctane GU as well to fuel the final 5mi. I was happy to be back on offense and stoked to run down as many runners as I could! 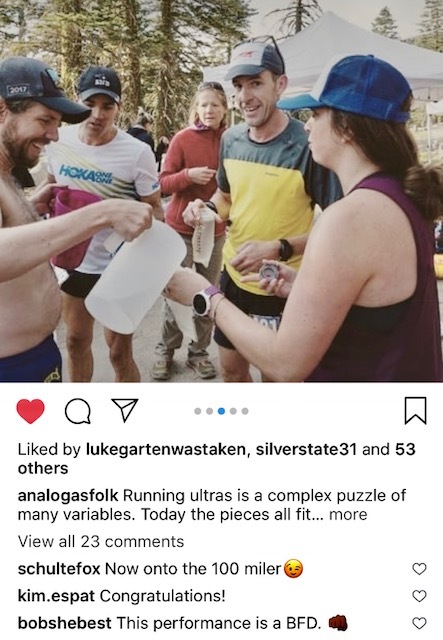 I caught one at the final aid-station, where I still had about 80% of my bottle left, so didn’t need to stop there, just kept motoring, trying to remember I was allowed to run this hard, given the fact it wasn’t an ultra and I basically had license to kill. With a mile remaining, I passed one last runner, who turned out to be a Schulte doppelganger! I didn’t have much hope I would catch Patrick since I was so quickly running out of real estate. When I finished I slowly realized I finished in third (not 2nd) with the real Erik Schulte, 13min up. Patrick Parsel beat me by a whopping 21min! Had I not raced TRT 55k, perhaps I could cut that down by a couple minutes. Honestly though, it was just great to race these guys. That’s what this month was all about—aggressive racing! In the string of Saturdays, I just got into rhythm. Saturday’s coming… Gotta get the body ready! 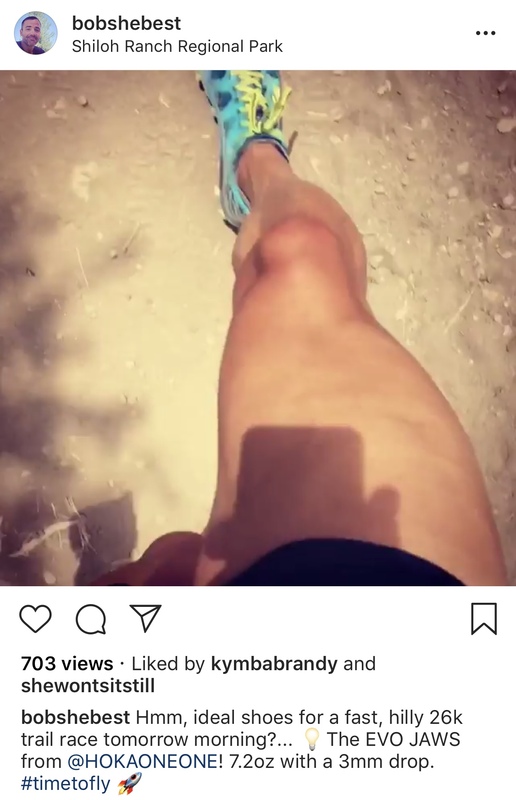 By Tuesday or Wednesday, depending, I’d be back on the trails again, some Wednesdays turning into double-days, because I found myself wanting to run twice, get myself feeling loose. Thursdays were always complete rest days, since I also take off the day that’s two days out from race-day. Fridays were typically a Fartlek—what I call a “Play”—session in the morning, then travel, with a short run upon arrival to the race venue. During this racing phase, designed to build in speed, strength, and mental ferocity, I stacked up 90 quality miles of relatively intense racing. 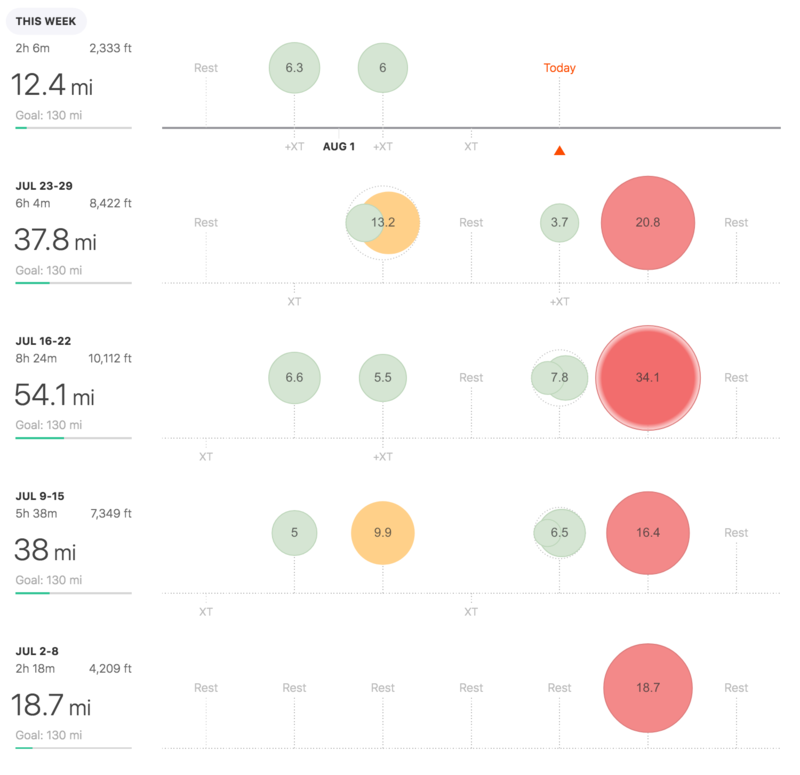 According to ever-generous Strava, I ripped up 18,500′ of climb in these events. 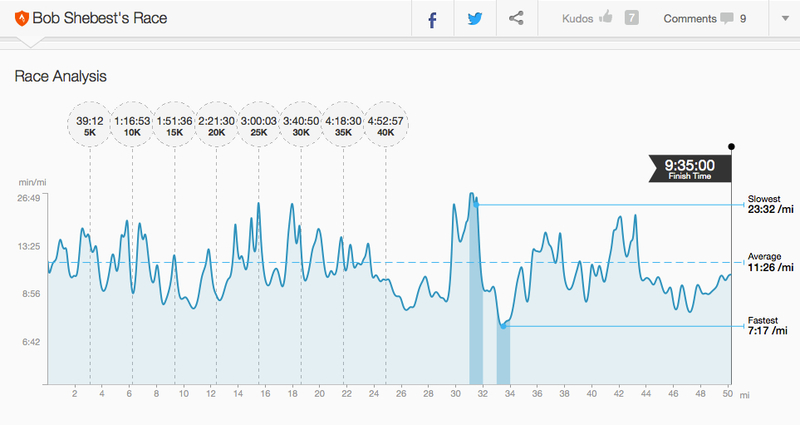 My fastest average pace was at Salt Point (a two hour, 16mi race) with a cumulative pace of 7:19/mi. My slowest go was Lost & Found, averaging 9:20/mi pace over the approximate 20mi, on that mountainous, technical course. All in all, four successful race experiences, with three 1st place overall finishes, one CR (at Golden Gate) and one 3rd place finish, where I got smoked by Patrick and Erik. 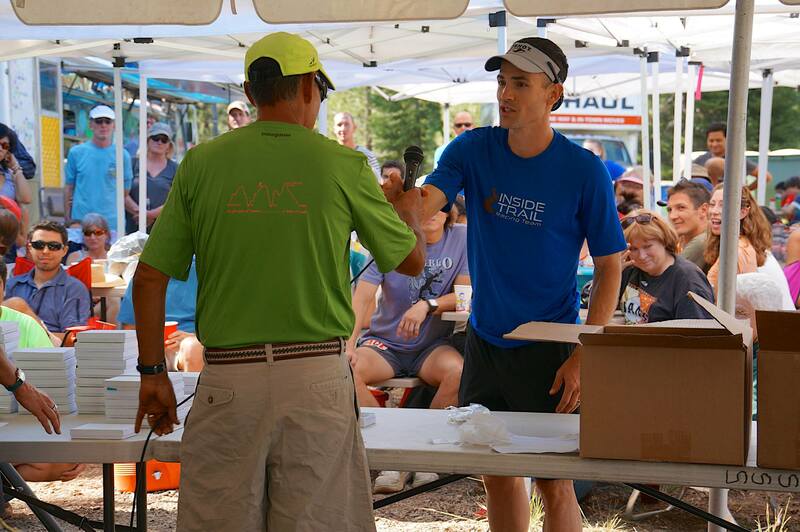 If I was lost after Western States, I’d find myself by the time July came to a close. A heartfelt note of appreciation to my beautiful and highly supportive wife/agent, Amanda. Thanks for putting up with a month of Saturday races. I love you mucho! | Thanks to all the athletes I coach who inspire me with their passion and dedication to this crazy sport. It’s always such a treat to be out there on these race courses with you! 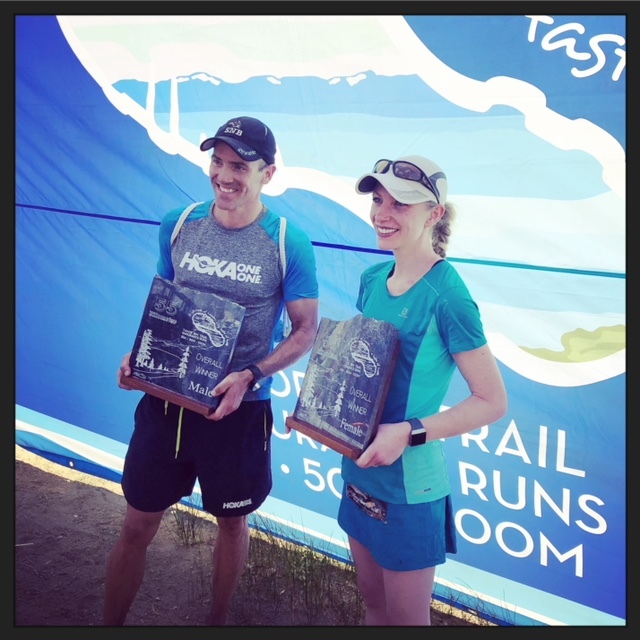 #point_positive | Thank you to HOKA ONE ONE for producing the best trail shoes out there—#EVO Jaws #Speedgoat_2 #timetofly | Thanks Healdsburg Running Company for all your effort to support our local running community | Gratitude to Casey Rolig from BUFF USA. | Thanks to Drymax Sports, for making the most comfortable, durable socks out there. | Squirrel Nut Butter every Saturday, everywhere, never chafe! | GU fueled these 4 consecutive podium finishes. Iced down Summit Tea FTW! 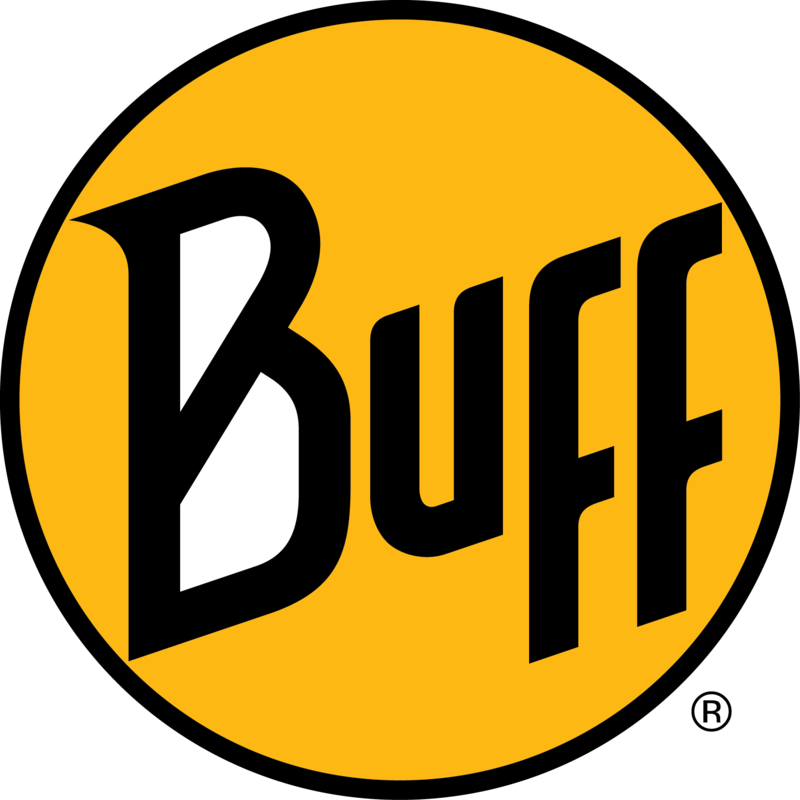 #guforit | Finally, thanks to Dave Townsend at Santa Rosa Physical Therapy. I haven’t been in to see you in a long while, bud. Let’s keep it that way! It’s good piece of mind knowing you’re out there doing great things for us [over]active folks. Any time my athletes need a PT, you know where I’m sending ’em! | Finally, heartfelt thanks to Coastal Trail Runs, Pacific Coast Trail Runs, Tahoe Rim Trail Endurance Runs, and Epic Endurance Events. Running events add so much “life to our days,” and vitality to our lives! I’m grateful to have these opportunities to test myself, grow stronger, wiser, cultivating a healthy, evolved, and sustainable relationship with running and competition.